Enriched with all the experience and scholarship of this senior pastor and founder of ‘In Touch Ministries’, The Charles F. Stanley Life Principles Bible provides an alternative ‘Life Application’ Bible to those of other publishers. Thoroughly grounded in the New King James Version with its long heritage of poetic language and word for word translation style, this Study Bible offers a more evangelical and fundamentally biblical approach to interpretation and meaning for your life in the world today. The 30 ‘Life Principles’ are illustrated and supported by Bible based articles throughout, gathered from many years of Bible teaching and pastoral ministry, this Bible overflows with practical articles, ‘Life Lesson’ notes, and sidebars that help readers understand what the Bible has to say about life’s most important questions. With more than 442,000 in print, The Charles F. Stanley Life Principles Bible features, Life Examples from the people of the Bible, God's Promises for Life index to get into the Scriptures, book introductions, concordance, maps and charts. NKJV Charles F. Stanley Life Principles Bible by Charles F Stanley was published by Thomas Nelson in April 2013 and is our 5284th best seller. The ISBN for NKJV Charles F. Stanley Life Principles Bible is 9781418550332. 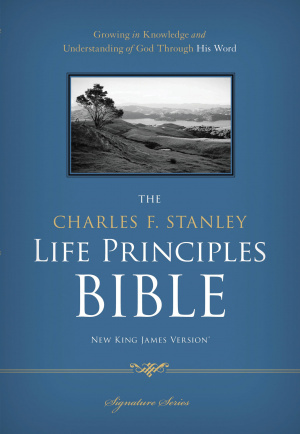 Be the first to review NKJV Charles F. Stanley Life Principles Bible! Got a question? No problem! Just click here to ask us about NKJV Charles F. Stanley Life Principles Bible. Please does the Bible have a thumb index feature? Thank you. A:This Bible does not feature a thumb index. The Charles F. Stanley Life Principles Bible delivers Dr. Stanley's cherished values to benefit every Christian in his or her life's pursuits. With more than 442,000 in print, The Charles F. Stanley Life Principles Bible communicates the life principles Dr. Stanley has gleaned from the Word through his years of Bible teaching and pastoral ministry. The result is a Bible overflowing with practical articles, notes, and sidebars that help readers understand what the Bible has to say about lifes most important questions. Dr. Charles Stanley is senior pastor of First Baptist Church in Atlanta. He is the founder and president of 'In Touch Ministries'. His best-selling books include The Source of My Strength and How to Listen to God.